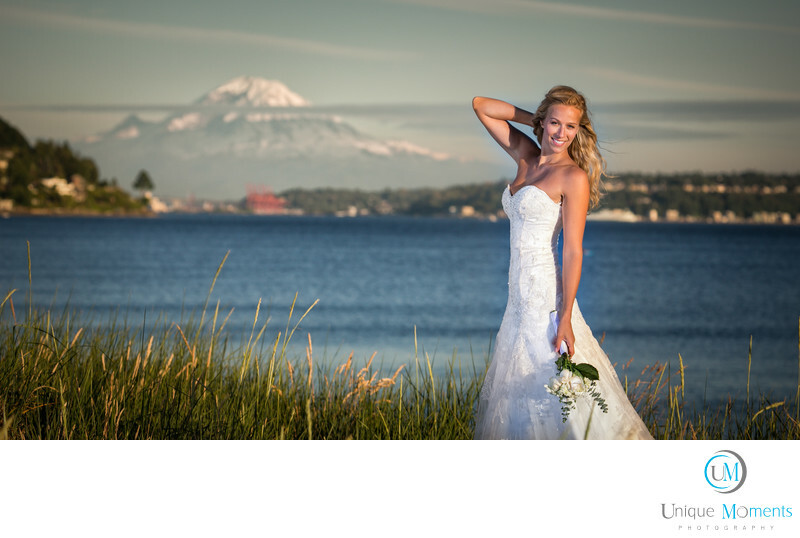 Discovery park in Seattle is an awesome location to capture bridal portraits. On a clear day, Mt rainier is usually in the background. The tall grass on the beach, Mt rainier in the background and the cool deep blue waters of Puget sound always makes for wonderful images. This was a day after session and this beautiful young lady put her bridal gown back on for some additional captures that were not possible on her wedding day. Day after sessions are a great way to capture images at locations you cant get to on the wedding day. You can get yourself to a location of your choice and capture beautiful creative images with no stress from the wedding day time line. Day after sessions are a ton of fun. Ask Unique Moments Photography about fun locations for your day after session. Location: Discovery Park 3801 Discovery Park Blvd, Seattle, WA 98199.